I am shocked by the statement that she “would rather not spend it [her money] on expensive dental care.” Really? Who should pay for the things you need? Retirees on Medicare believe they can forego the expense of additional dental insurance or the cost of seeing a dentist by simply choosing to avoid it until something really bad happens. It may be a poor choice to save a short-term expense by potentially increasing a longer-term health risk, but I’m grateful we have that choice. 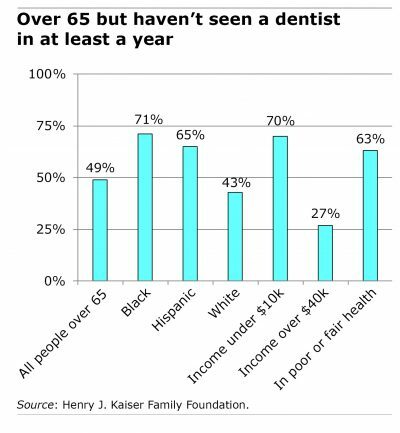 Years ago, I lived in both England and then Canada where it is common that older adults have extremely poor dental health. It is complacently accepted in those countries that pensioners would be missing most or all of their teeth as young as their 50’s. Dentists in England primarily perform extractions and service dentures while routine cleanings are unusual. This is a result of the cost-conscious universal healthcare schemes in those countries which eliminate choices for people to improve their health. Here in the US, I think we need to improve the tools and information retirees have for making good health choices rather than assuming the system is broken and needs to be overhauled. Be careful when you seek to have others pay for what you want to be able to choose for yourself. She’d rather blow some cash on the grand kids than pay for dental care. I’d rather spend my money on fun stuff, too, but health comes first. It’s those who have no money and no insurance that I care about, because bad teeth lead to bad health. To quote my orthodontist, England is the land that dentistry forgot. I moved from the UK to the US 24 years ago and was immediately impressed by the gleaming teeth. Relative to other countries, dentistry is something the US gets right. And teeth are important. They not only enable you to eat, they also get you better dates. Good grief. I am lucky to have had a mom who emphasized brushing and dentistry from early on. I lost my dental care, too, when I retired (the math indicated it about broke even on 2 cleanings so I pay my way). I work part-time in a nursing home and only one person that I see has her own teeth and she came from a family with resources. I guess the false teeth/dentures belong to those with them. After a dental cleaning last week I have another appointment for a filling. While I am not thrilled about it, I am grateful to know about it and be able to have it taken care of soon. It is refreshing to hear some positives about our dental system in contrast to the medical system. 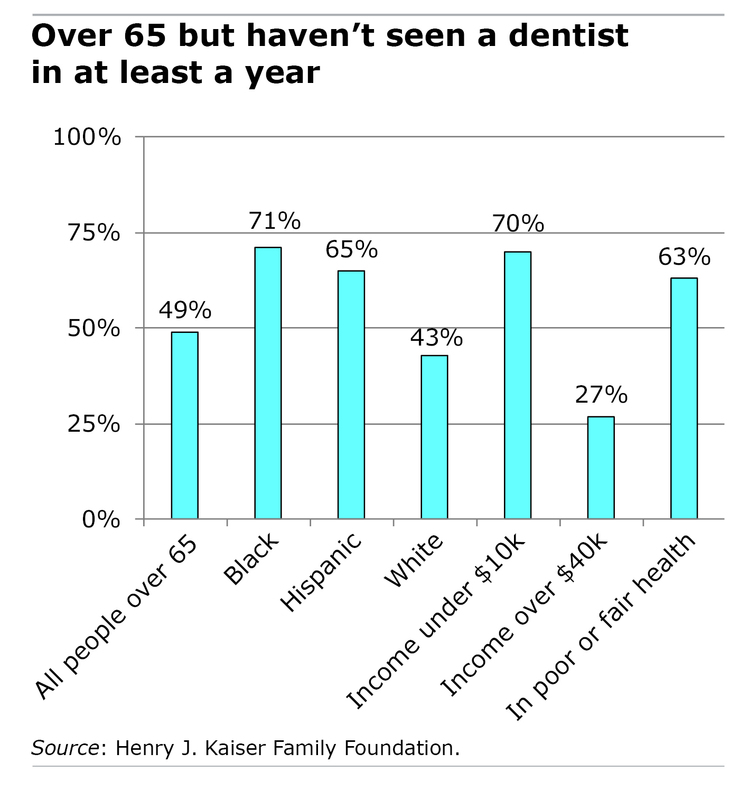 Post-retirement dental insurance is a rip-off. I was paying $600 in premiums yearly for $1,000 max coverage, thank you MetLife! We are now self-insuring. Insurance should cover routine dentistry. Gum disease, especially when left untreated, is a precursor for heart disease, which is a much more expensive, covered expense. Every time I go in for a cleaning at my dentist the price goes up! I’m paying close to $200 now. I did get a break last time because I said I’d forgo seeing the dentist. Add in the x-rays and the trips to the periodontist, I’m looking at $1,000 a year.